Eric Dahlin, 57, of Simsbury, passed away suddenly at his home on Friday, October 12. 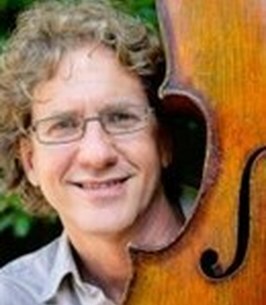 Eric has been a pillar of the Connecticut musical community, as cellist with the Hartford Symphony Orchestra for 37 years and teacher to many generations of young cellists. Born in Minneapolis, Eric began his musical training with Cynthia Eddie Britt. He received his B.M. from The Hartt School of Music and his M.M. from Yale University. His teachers included David Wells, Aldo Parisot, Derek Simpson and Bernard Greenhouse. Eric was hired by the Hartford Symphony during his second year of undergraduate studies and won the audition for Assistant Principal Cello in 2004. He performed extensively as a chamber musician, and loved teaching at his home studio and The Hartt School. Eric was the founder of Music Adventure, a summer chamber music program in Italy. He will be remembered as an extraordinary father, a consummate artist, and a captivating teacher. He is survived by his partner of many years, Katie Kennedy, his two sons, Martin and Elias, his parents, Inger and Donald Dahlin, and his brother Kai Dahlin. A memorial service will be held on Saturday, November 17, at Asylum Hill Congregational Church, 814 Asylum Avenue, Hartford at 1pm. Donations in Eric's memory may be made to the Friends of Spannocchia and designated for the Music Adventure Scholarship Fund, PO Box 10531, Portland ME 04104, or online at https://spannocchia.kindful.com. We encourage you to share any memorable photos or stories about Eric. All tributes placed on and purchased through this memorial website will remain on in perpetuity for future generations.